PAUL ROETZER is founder and CEO of PR 20/20, a Cleveland-based inbound marketing agency. PR 20/20 was the original firm in HubSpot’s certified Agency Partner program, which now includes more than 1,500 agencies worldwide. 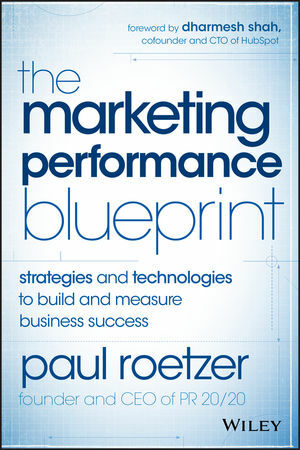 Roetzer’s first book, The Marketing Agency Blueprint (John Wiley & Sons, 2012), serves as a guide for building tech-savvy, hybrid marketing agencies. A graduate of Ohio University’s E.W. Scripps School of Journalism, Roetzer has consulted for hundreds of organizations, from startups to Fortune 500 companies, and been recognized by Smart Business as an Innovation in Business Rising Star. He is the creator of Marketing Agency Insider and Marketing Score; a regular contributor to leading marketing industry blogs; and a frequent speaker on the topics of agency management, content marketing, inbound marketing, marketing measurement and performance, public relations, social media, and strategy.